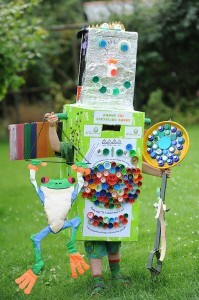 Landfill materials recycled to raise money…. Since 2012 Sussex Green Living has set up various recycling schemes which divert waste resources from landfill and into the circular economy (recycling companies). Money raised from collecting these materials financially benefits charities and not for profit organisations, currently the William Penn Primary School in Coolham, the Springboard Project in Horsham and the Purple Community Fund in Manila, Philippines. The most important thing is that we upcycle or recycle these materials rather than put them in the landfill or incinerator. Many of these materials are likely to take hundreds if not thousands of years to biodegrade into something we might ever be able to use again. So collect these waste resources for us or set up your own scheme. We work with a number of charities and companies who recycle these waste resources. TerraCycle is one of the companies who help diverts billions of pieces of rubbish from our landfills and incinerators (both of these options produce added carbon and other greenhouse gases). These materials are made into new products which reduces the need for new materials to be extracted from our planet. You can download this poster to promote this recycling scheme in your community, school or business here. Either deliver the waste resources to one of these addresses, or you could set up a micro-site for us (bringing your waste resources periodically) or set up your own scheme with your chosen beneficiaries, learn more here. Quaker Meeting House, Worthing Road, Horsham, RH12 1SL (please use the green bin by cottage door, right side of the main building, under the window) – any recycling. Or Carrie the founder of Sussex Green Living’s address for those that know her! – any recycling. Members of the public can recycle their plastic milk bottle tops in the Sussex Green Living (SGL) public collection bins, as detailed below. Income generated from these waste resources benefits the Springboard Project in Horsham. It is a community based charity that provides inclusive play and leisure opportunities for families with young children and fun short breaks for children and teenagers with disabilities. Free of any paper, rubber or foil inserts or labels. We can only recycle bottle tops which displays in a triangle on the underside of the lid the number 2, 02, 4 or 04. 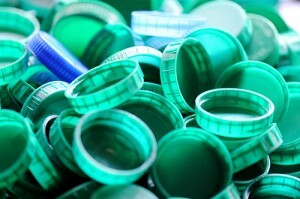 Plastic bottle tops can be made of many types and grades of plastic. As we DO NOT have time to sort large quantities of plastic lids, we request that you only recycle MILK BOTTLE TOPS as these are always made of 02 and 04 plastic and visually we can see that we only have the right waste resource. They are recycled to make hard plastic toys for children, such as slides and other garden toys. They also go to make more bottle tops! If you would like to set up a plastic bottle top recycling scheme for your chosen charity, or you are a company who could provide a recycling point where bottle tops can be collected in bulk contact GHS Recycling in Portsmouth. 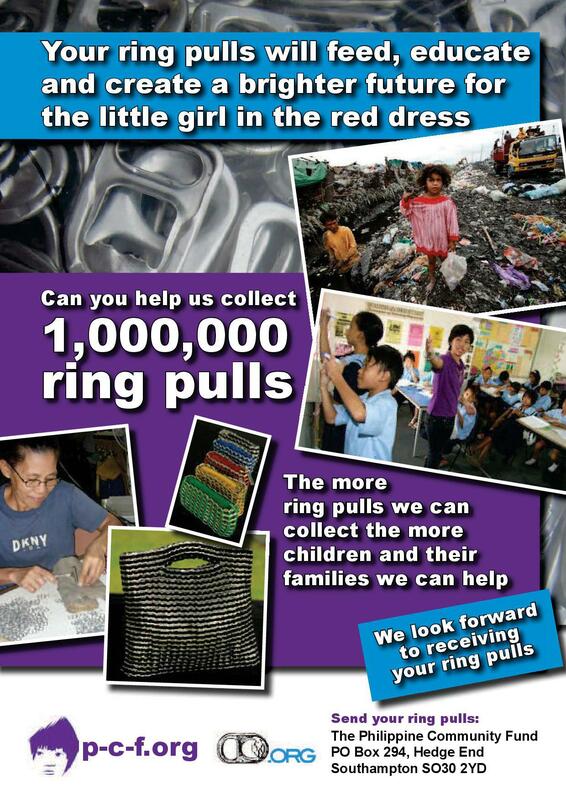 We collect aluminium ring pulls for the Purple Community Fund, which helps Filipino families in Manila, they are taught how to make beautiful merchandise with this waste resource: read more about The Purple Community Fund (PCF) here. We sell some of their merchandise on our recycled green stand, see some of their products here. All the proceeds going back to help the PCF livelihood scheme and help fund 800 children off the dumpsite and into the PCF school (which is made out of upcycled shipping containers). 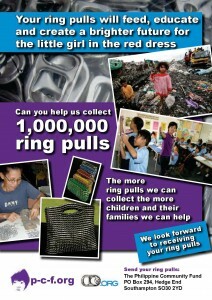 Albeit you can recycle aluminium ring pulls in your recycling bin at home, we also collect them for the PCF. These are like gold coins to the Filipino families who are supported by this charity and make a huge difference to their lives. More information can be read here. All you need to do is put them in a bag then pop them in our collection bins, please don’t put them in loose! Or Carrie’s address for those that know me! Carrie from Sussex Green Living works in partnership with West Sussex based Bags of Support, a multi-award winning textile recycling company. Through Bags of Support any school can raise much needed funds and recycle unwanted clothing. Learn more about the Bags of Support and Sussex Green Living school collaboration here. Members of the public are invited to drop off unwanted clothing, materials, bags, soft toys and shoes (we can take rags too) in a bin liner into the textile bin in the staff car park at William Penn Primary School in Coolham. Or you might like to set up your own scheme more information here. Horsham based mother of 3, Karrie set up Bags of Support in 2012. She was frustrated by the amount of textile waste produced in this country and the simultaneous need for clothing abroad. Karrie has lots experience of schools and PTA and was well aware of how important but difficult and time consuming fundraising can be for schools. This great Horsham community organisation helps to raise money for schools, prevent textiles from going to landfill* and provides an ongoing supply of clothing and shoes to poor families in Romania. There is no limit on the number of collections you can have but Bags of Support recommends one a term for the best results. The clothes need to be clean and in good condition. * 1.2 million tonnes of household textile waste goes to landfill each year. Through the Sussex Greener Living campaign we recycle only HP, Dell, Lexmark, Canon, Samsung, Neopost cartridges. Drop off locations can be found here. There are many other charities who collect ink cartridges diverting them from landfill and financially benefiting the given charity, more information can be found here. Inhalers can be recycled through 205 participating Co-operative Pharmacies as part of Complete the Cycle, a groundbreaking scheme from GlaxoSmithKline and TerraCycle. 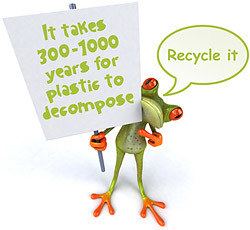 Or you can find a recycling facility nearer your home or work here. All you need to do is put the items in a second hand carrier bag, making sure each type of recycling is clean, dry and in separate bags. Write on the bag which cause you want the money to go towards. If there is no cause written on the bag the proceeds will be split between them. If they are in good condition you could give them to friends, family or a charity shop, give them away on Freecycle or Freegle, see below. You can recycle them through your local Household Waste Recycling Site (HWRS). If you are needing to make a little extra money, you might consider sending them to Music Magpie who will sell them for you or you can donate the proceeds to a charity. Some charities offer a recycling service along with their ink cartridge recycling envelopes. Many charities as part of their commitment to the environment and to raise money, recycle unwanted goods. For example through the RSPB and the RSPCA you can recycle digital cameras, sat navs, game consoles (Nintendo DS / Sony PSP) and iPods.